Profession: Multi-disciplinary designers for visual communication, editors / curators / authors, art directors, fashion label / shop owners. Agathe and Tomi are parents of three beautiful children. ___ FL@33 is a multi-disciplinary design studio for visual communication based in London. Its two founders, Agathe Jacquillat and Tomi Vollauschek met on the Royal College of Art’s postgraduate Communication Art and Design course in 1999 and set up their company after obtaining their MAs in 2001. ...integrated design solutions for a diverse range of international clients across various industries, scales and budgets. FL@33’s work encompasses art direction, logos and identity systems, book design, book and magazine covers, posters, publication and editorial design, illustration, digital, moving image, exhibitions and websites. FL@33 is well-known for delivering outstanding results and a dedicated and personal service. The studio’s extensive experience and dedication is reflected in their portfolio – now spanning over a decade of vibrant, fresh and engaging visual communication. ___ The two launched Stereohype.com – a graphic art and fashion boutique – in 2004: it is an international platform for both emerging and established talents. ___ The duo have also released self-initiated projects such as the award-winning Trans-form magazine and the online sound collection project bzzzpeek.com. ___ FL@33 interviews, features and studio profiles have been published online and in more than 170 magazines, newspapers and books around the world. Interviews with the duo also appeared on BBC Radio and NPR (America’s National Public Radio). ___ Agathe Jacquillat and Tomi Vollauschek often judge competitions and award schemes, including YCN, FITC, D&AD and Selected. 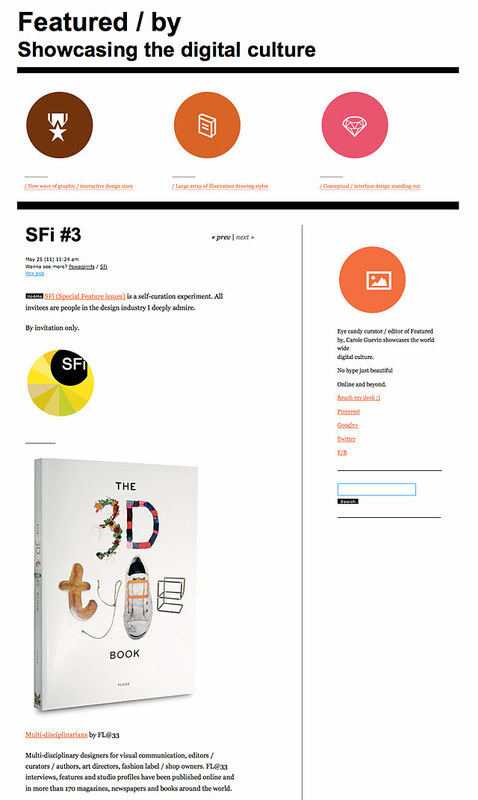 In 2010 FL@33 gave a talk in Barcelona at the Selected A: Graphic Design from Europe conference, which was organized by Index Book. A FL@33 monograph was published in 2005 as part of the bilingual (English and French) design&designer book series by Pyramyd Editions. ___ Three other books conceived, compiled, written, edited and designed by FL@33 have been published by Laurence King: Postcard appeared in 2008, followed by Made & Sold: Toys, T-Shirts, Prints, Zines and Other Stuff in 2009 and more recently The 3D Type Book in 2011. Postcard was also translated into French (Cartes Postales, Pyramyd Editions), German (Postcard: Postkarten-Design heute, DuMont Buchverlag) and Spanish (Postales: Diseño por correo, Gustavo Gili). ___ The studio’s international clients include MTV Networks, the BBC, the Royal Festival Hall, Laurence King Publishing, Creative Review, Computer Arts, Groupe Galeries Lafayette, Matelsom, Habitat, Penrhyn Books, Weeks & Cowling, MMM-Festival and Friends of the Earth, beside others. Getting the balance(s) right is a continuous challenge. Sometimes we overcome this hurdle and succeed, naturally other times we stumble – but if so – we always get up and try even harder next time around. ___ We always try to get the balance right between... ...commissioned work and self-initiated projects (that of course inform each other), ...time spent in professional life and private life – especially now being parents, ...a true passion and commitment for what we do professionally and drawing a clear line in our personal lives when things are stressful at work. ___ And last but not least a balance in our work itself between emotions, skills and intellect – a guideline more than a philosophy that is called the 'Power of 3' (something we first heard about at the Royal College of Art and that we always keep in mind when we develop our projects). 1 | Meeting each other at the Royal College of Art. 2 | Travelling from London to Frankfurt (only a few months after setting up FL@33) and being recognized (by name) when we introduced ourselves at the Laurence King Publishing stand during the Frankfurt Book Fair 2001. 3 | Being commissioned to design the Creative Review magazine cover (Nov 2002). 5 | Being offered the chance to have a FL@33 monograph published by Paris-based Pyramyd Editions (and manage to secure edition number 33 on top of that). 6 | Receiving a parcel from Hong Kong containing our Mr Papillon Kit Cat Qee produced by Toy2R. 7 | A big bzzzpeek.com article in the New York Times, followed by international newspapers containing NYT supplements with Bzzzpeek on it's titel page. 8 | NPR (America's National Public Radio) and BBC World (Boston) calling us in within two days to arrange interviews in the BBC HQ with the bzzzpeek.com creators. 9 | Receiving an advance copy of our first book — called Postcard, that FL@33 conceived, wrote, compiled, edited and designed and that was published and translated from English to French, German and Spanish. 10 | First selected Stereohype button badges being (properly) mass-produced for the first time and stocked at tilt points by well-known high street furniture store Habitat across France and United Kingdom — allowing us for the first time to (voluntarily) pay royalties to the selected designers. FL@33 is celebrating its 10th Anniversary in Summer 2011 and this seems to be a perfect moment to reflect, plan and reconsider everything. ___ A new building that will be housing our new studio is currently being built and we can't wait to move in finally – probably early next year. This will allow us to finally have a decent photo / repro corner, place a future fussball table, welcome our clients and collaborators in our new meeting room, and will also allow us to take interns on board – something we were only dreaming about until now. ___ What next? We can't wait to find out what the adventures of the next decade will be.